BARBARA KLEIN: Welcome to the VOA Special English program THIS IS AMERICA. I’m Barbara Klein. CHRISTOPHER CRUISE: And I’m Christopher Cruise. This week we tell about several American actors who were widely recognized years ago. But they now are not big stars or famous like they once were. We ask them how they dealt with these changes. BARBARA KLEIN: Imagine you are one of the most-famous movie stars in the world. Millions of people pay to see your films, and everyone seems to know your name. Thirty years later, you are attending a comic book convention in Philadelphia, Pennsylvania. You sit alone, almost unrecognized, waiting for people to come and shake your hand. Richard Roundtree played the part of police detective John Shaft in three movies in the early nineteen seventies. The movies made him an internationally recognized movie star. Since then, he has had a good career on television shows. But he has never been as famous as he was when he played John Shaft. CHRISTOPHER CRUISE: Richard Roundtree was so well-known for the part that he was chosen to play few other roles in the nineteen eighties and nineties. That was because casting directors believed that movie goers could not see him as anyone other than John Shaft. The actor told VOA the fame that came from the Shaft movies was not easy for his family. But he says he missed the recognition when it went away. Richard Roundtree says he once told his father that he was unhappy to be known only as John Shaft. He says his father told him that many people would want to be in his position. The actor told VOA that his father told him to “shut up” and stop complaining. 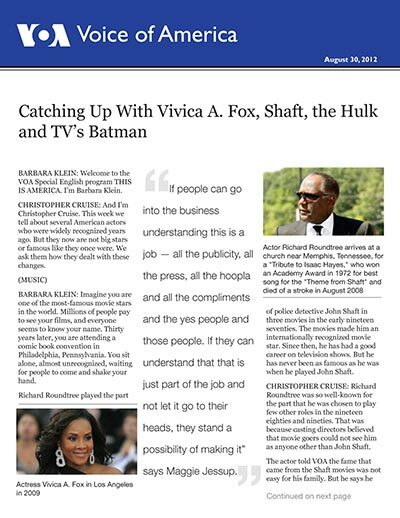 BARBARA KLEIN: Actress Vivica A. Fox was at the same event in Philadelphia as Mr. Roundtree. She appeared in many movies and television shows in the nineteen nineties and in the first few years of the twenty-first century. Back then, Vivica A. Fox was known for her good looks. She is now forty-eight years old. While still beautiful, she is no longer as busy or as famous. Younger actresses are given parts she once played. She says she is not surprised by that. Ms. Fox has taken her own advice. She has moved away from the roles that beautiful, young actresses play to being a beautiful, older actress. She does not appear in as many movies as she did when she was younger, but she stays busy in acting. And for many actors, that -- and not stardom -- is what matters. CHRISTOPHER CRUISE: Adam West is known as Batman to many people in the United States. He played the role in the Batman television series in the nineteen sixties.  The show can still be seen on television stations around the world. Adam West says that after the show was cancelled, he had a difficult time being less famous than he once was. But he says that period lasted just a short time. Then, he got back to work. Mr. West told VOA that as long as he is paid for his work, that is all that matters. He says being famous does not pay for food, housing and other costs, but work does. BARBARA KLEIN: Burt Ward played Batman’s young helper, Robin the Boy Wonder, in the television series. Like Adam West, Burt Ward appears often at fan conventions. Many people pay to see their childhood heroes, and are happy to have their picture taken with them. Mr. Ward told VOA his fame has never really gone away. Reports say Burt Ward was paid very little to play Robin in the television series. But he says he has made a good living appearing at fan conventions over the past forty-five years. Lou Ferrigno also is known for playing a superhero. The former bodybuilder was “The Incredible Hulk,” a green-skinned comic book character on the television series of the same name. The show was popular in the late nineteen seventies and early eighties. Lou Ferrigno says he has dealt with the ups and downs of fame by doing different things. CHRISTOPHER CRUISE: Finally, John Schneider is best known for playing the role of Bo Duke in “The Dukes of Hazzard.” It was one of the most-watched television series in the United States in the early nineteen eighties. John Schneider was in his early twenties when the series began. Now in his early fifties, he is still tall and good-looking. Mr. Schneider says he has a difficult time dealing with the idea that he will never be as famous as he once was. JOHN SCHNEIDER: “Part of me still believes that my best days are ahead of me. I see it happen all the time to people. I have a lovely wife, I have lovely children. They get you through a lot of it. But it really, it is devastating to have gone up to bat and hit a grand slam, and hit doubles and triples from that point on. None of its good enough. So, I can’t remember who said it, but I just recently heard somebody say ‘I started at the top and worked my way down.’ Sad but true." John Schneider told VOA he thinks the actor James Dean got it right: die young and when you are most-famous. The actor died in a car crash in nineteen fifty-five at the age of twenty-four. Mr. Schneider said that if Dean and the actress Marilyn Monroe had lived, they would probably be making appearances at fan conventions like he does. BARBARA KLEIN: Maggie Jessup and her husband, Jay, operate a business called Platform Strategy. It helps people become and stay well-known. 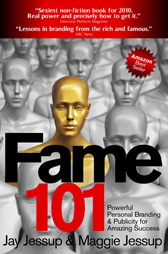 Maggie and Jay Jessup wrote a book called “Fame 101.” She says actors can avoid losing their fame by being willing to accept different parts -- and by not letting others to define them. Maggie Jessup says a lot of the stars of today are making the same mistakes as those who have gone before them. As a result, they are not as marketable as they once were. Ms. Jessup knows of actors who were once famous, but are no longer as in demand like they once were. She says many of them have a difficult time dealing with the new reality. So she tells her new clients to separate themselves from what others are writing and saying about them. In her words, if you believe everything others say about you, there is nowhere to go but down. BARBARA KLEIN: And that’s THIS IS AMERICA, a VOA program in Special English. Our producer was Brianna Blake. I’m Barbara Klein, with Christopher Cruise, who wrote this week’s program. Join us again next week for THIS IS AMERICA in VOA Special English.